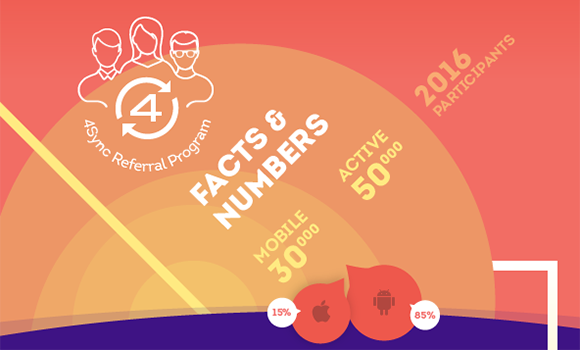 Even though it hasn’t been long since we officially launched the 4Sync Referral Program, we’ve already got some impressive facts and numbers to share! As you remember, we introduced the 4Sync Referral Program back in August 2015 and further launched the new, Mobile Referral options in the 4Sync apps for Android and iOS right before the Christmas Holidays. Since last than a year has passed, you might think it’s probably too early to report any results. Well, we wouldn’t be so sure. and has exceeded 30 000 mobile users! The active participants of Mobile Referral Program are mostly Android users – 85%. User activity on iOS is rapid growth, esp. in March- April 2016.
and this number is rapidly increasing with time. Click below browse our exquisite infographic with more 4Sync Referral Program facts!